All eyes are on Jerry Brown as a united chorus — from the cannabis industry to police to cities and state lawmakers — is urging the governor to sign a trio of bills regulating medical marijuana for the first time. Brown has until October 11 to sign AB 266, SB 643, and AB 243. If that deadline lapses, the bills can be chaptered without the governor’s signature and will become law. Capitol insiders say it would be very strange for the governor to either veto or just plain not sign the bills. The Governor’s Office brokered the final language of the bills. Insiders suspect the wait is a matter of pomp and circumstance. A parade of actors — the bill’s authors as well as other sponsors — have taken turns taking credit and urging the governor to sign the bill. 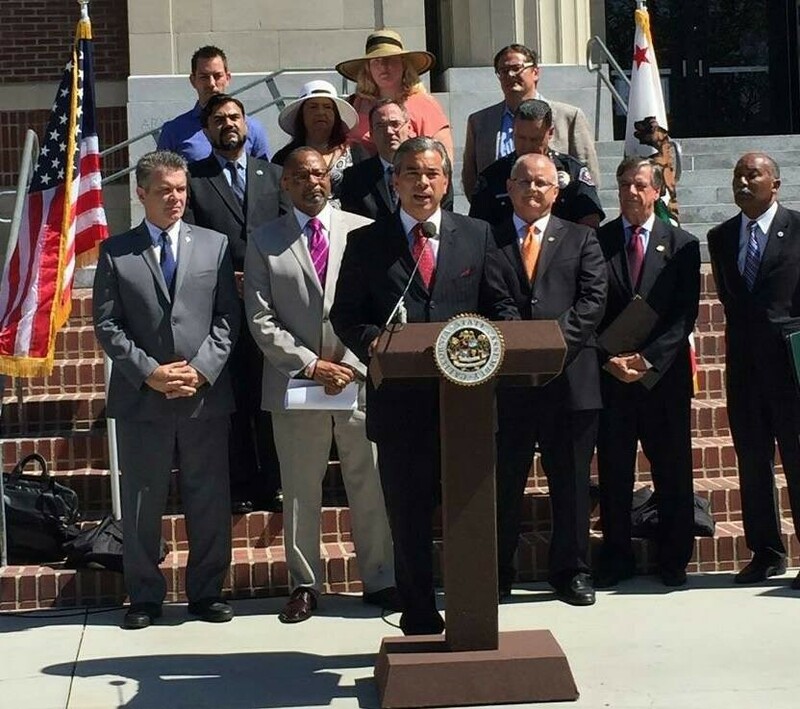 Assemblymember Rob Bonta holds a press conference with regulations co-authors urging Brown's signature. The parade has been joined by a chorus of editorials from across the state — including the Los Angeles Times and the Sacramento Bee — endorsing the regulations. "Each endorsement confirms that California can no longer ignore an industry that has operated for nearly 20 years with no testing standards, little enforcement, environmental neglect and no tools to combat drugged driving. Too much is at stake for California to let the medical marijuana industry go on unregulated," said Assemblymember Rob Bonta, in an editorial. Supports also include industry groups such as Americans for Safe Access, the California Cannabis Industry Association, as well as the League of California Cities and the California Police Chiefs Association. "As the original sponsors of AB 266, we are thrilled that a thorough medical marijuana regulatory package (AB 266, AB 243, SB 643) now sits on the Governor’s desk. The regulation of medical marijuana in our state will yield positive results for local law enforcement, cities, counties, patients and members of the public"
On Tuesday, bill coauthor Assemblymember Jim Wood hosted a bill-endorsement rally with Bonta on the steps of the Humboldt County Courthouse.